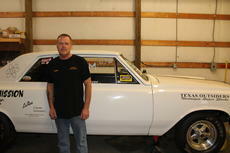 A local business owner is carrying on the family tradition of working on vehicle transmissions. Wolford Transmission owner Dale Wolford is shown standing next to his 1965 Oldsmobile Cutlass. Wolford drag races and works on transmissions and other prep-racing issues for other drag racers. Wolford Transmission also provides other mechanical work for customers including rebuilding or overhauling transmissions, reprogramming computers in vehicles, towing and more. Wolford Transmission provides a wide variety of mechanical work to customers including rebuilding or overhauling transmissions, reprogramming computers in vehicles, towing and much more. The business is located on 226 East Main Street in Hodgenville. Their hours are from 8 a.m. to 5 p.m. on Mondays through Fridays. Owner Dale Wolford said that he has been a mechanic around 38 years and that he learned the trade from his father Earl Wolford who opened Wolford Mechanics in 1998. After serving in the U.S. Air Force for 20 years, Wolford retired in 2000 and purchased Wolford Transmission from his father in 2001. He said he also became Automotive Service of Excellence (ASE) certified in 1998. Wolford went on to say that he drag races competitively at different tracks throughout the state and that the networking has helped him build up a clientele. For more information about Wolford Transmission call 270-358-8477 or email www.wolfordtransmission.net.